Soak 6 long wooden skewers in water for 30 minutes (this helps to prevent them burning). Prepare and light the barbecue. Mix the fennel seeds and oregano in a bowl with 2 tbsp of the oil and a little seasoning. Add the chicken pieces and stir to coat evenly. Cover, chill and leave to marinate for at least 15 minutes. Meanwhile, chop the preserved lemon skins. Mix with the parsley and garlic to make a 'gremolata'. Beat the remaining oil with the lemon juice. 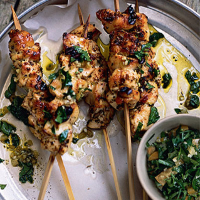 Thread the chicken pieces onto the skewers and cook over the barbecue for about 8-10 minutes, turning once, until golden, the chicken is thoroughly cooked, there is no pink meat and the juices run clear. Transfer to a warm serving plate. Whisk the lemon dressing, season and drizzle over the chicken. Serve scattered with the gremolata. To cook indoors: griddle for 3-4 minutes, turning once, until cooked through. Transfer to a warmed plate, finish as above.